This is the long awaited new project of Franck Fromy, founder member of the now legendary Shub-Niggurath. Unit Wail is the next step after his (sadly) little known « 000 » experience from 2000 (« Crypto Sensus » CD issued by Musea/Gazul). The line-up is Vincent Sicot-Vantalon (keys & all compositions), Philippe Haxaire (drums), Adrian Luna (bass), Emmanuel Pothier (synths) & Franck Fromy (guitar). Also featured on 1 track is James Hugget from US band Combat Astronomy. Propelled by a heavy rocking band, the music explores dark Crimsonian horizons, illuminated by Franck’s stellar guitar. 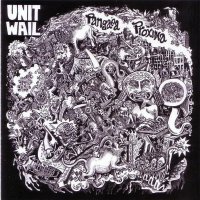 Unit Wail proposes us here somekind of dark Zeuhl post-rock, exploring little frequented side-paths.